The brand new design and fit out required for Neil Perry’s latest restaurant at Crown Casino Complex incorporates leading edge technologies in the cookbank, air handling and sanitizing equipment. The kitchen features a modular European cooking bank, complete with custom wood burning grill, a combined wood and gas fired oven, induction cooktops and a ventilated ceiling for extraction. Ewater technology was included for chemical free hand washing and sanitizing. The end result is a kitchen that is delight to work in and plays a major part in the award winning produce driven food. The brand new design and fit out required for Neil Perry’s latest restaurant at Crown Casino Complex incorporates leading edge technologies in the cookbank, air handling and sanitizing equipment. The kitchen features a modular European cooking bank, complete with custom wood burning grill, a combined wood and gas fired oven, induction cooktops and a ventilated ceiling for extraction. Ewater technology was included for chemical free hand washing and sanitizing. The end result is a kitchen that is delight to work in and plays a major part in the award winning produce driven food. Pub Bar Eatery in Melbourne’s Crown Casino Complex. Complete refurbishment of existing kitchen and bar facilities to meet change in food offer and patronage. Transition from short order to full service restaurant. The kitchen servicing Trinity College at Melbourne University is indicative of the modern hospitality facilities now offered at leading tertiary institutions. The existing kitchen required a major overhaul to bring it up to current food premises standards. This included a new layout to improve operational efficiency and all new floor, wall and ceiling finishes. The incorporation of a “high street” cafe offer preparing premium brewed coffee has been a welcome inclusion to college life. 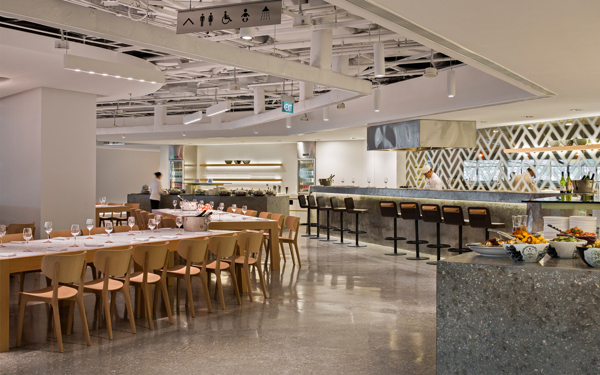 The kitchen servicing Trinity College at Melbourne University is indicative of the modern hospitality facilities now offered at leading tertiary institutions. The existing kitchen required a major overhaul to bring it up to current food premises standards. This included a new layout to improve operational efficiency and all new floor, wall and ceiling finishes. The incorporation of a “high street” cafe offer preparing premium brewed coffee has been a welcome inclusion to college life. Pinnochio’s Italian bistro and Pizzeria in Melbourne’s bayside suburb of Hampton was designed to cater to a busy and hectic family environment. The former bank building was totally gutted in preparation for the installation of a fully compliant kitchen, bar and associated stores and wash facilities. The feature wood fired revolving base pizza oven was a unique piece of equipment that enables maximum throughput with reduced labour costs, including the ability to produce the popular 1m long pizzas! The display coolroom showcases some of Italy’s finest ingredients. Can thoroughly recommend the slow braised lamb shoulder served with artichoke puree and basil pesto!! Pinnochio’s Italian bistro and Pizzeria in Melbourne’s bayside suburb of Hampton was designed to cater to a busy and hectic family environment. The former bank building was totally gutted in preparation for the installation of a fully compliant kitchen, bar and associated stores and wash facilities. The feature wood fired revolving base pizza oven was a unique piece of equipment that enables maximum throughput with reduced labour costs, including the ability to produce the popular 1m long pizzas! The display coolroom showcases some of Italy’s finest ingredients. Can thoroughly recommend the slow braised lamb shoulder served with artichoke puree and basil pesto!! The Conservatory is a 300 seat + premium buffet in Melbourne’s Crown Casino Complex, it is the main buffet used by the Crown Towers Hotel. Multiple sittings per day over three main serving periods producing a variety of local and international food. Buffet fit out included an “open” kitchen incorporating Asian and Western cooking equipment in a modular suite, theatre cooking displays featuring Tandoor ovens, a carvery, a dedicated dessert station and a multi tiered seafood and cold food display. The Jackpot Bar is a high turnover bar on the Main Gaming floor of Melbourne’s premier Crown Casino Complex. Unique design solution for the bar operations saw the fabrication of fridges which are rear loaded with pre-chilled bottled beverages from an adjacent coolroom. The inclusion of a high volume automated glass washing station has improved this labour intensive aspect of the bar operations. The project was executed on time and on budget. The Jackpot Bar is a high turnover bar on the Main Gaming floor of Melbourne’s premier Crown Casino Complex. Unique design solution for the bar operations saw the fabrication of fridges which are rear loaded with pre-chilled bottled beverages from an adjacent coolroom. The inclusion of a high volume automated glass washing station has improved this labour intensive aspect of the bar operations. The project was executed on time and on budget. 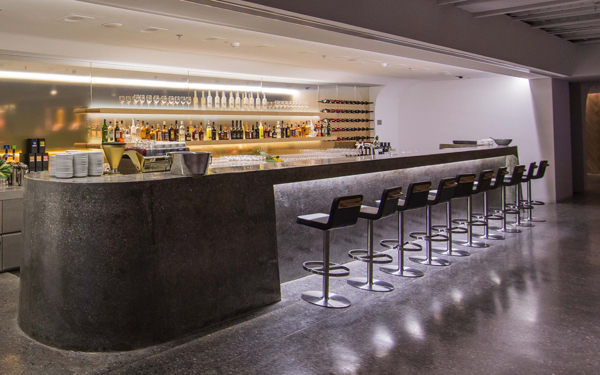 Chris Love Design is currently undertaking the design and documentation of refits for the kitchens, bars and buffets at Qantas 1st and Business class lounges at a number of locations in Australian and Asian Airports. 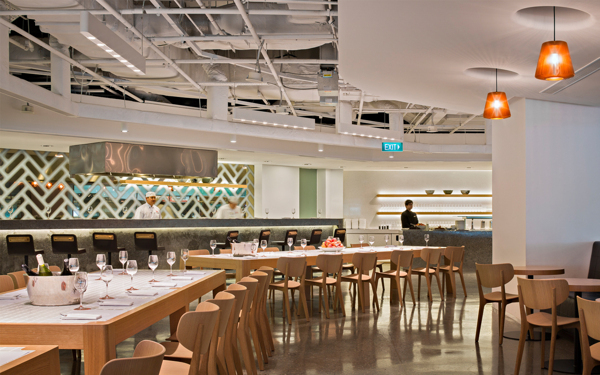 Recently completed was the Award winning Qantas Singapore Lounge. It is the first of its kind anywhere in the world and Australia for Qantas. It is a lounge that incorporates all of the different tiers within one space. With the combination of Neil Perry Rockpool menu, live cooking, communal dining, full service bar and service provided by Accor, this new lounge concept transcends the typical idea of airport lounges. – AWARDS 2014 – 7th International Design Awards – Interior Design – 1st PLACE / – IDEA Awards – People’s Choice – WINNER / – IDEA Awards – International project – SHORTLISTED. Chris Love design worked closely with all stakeholders to realise optimum outcomes. The contemporary lounge designs are by SUMU DESIGN, CAON STUDIO, PDM Singapore and menu’s are by Neil Perry.